During my commute home yesterday afternoon, I watched clouds thicken and grow dark to the south. When I exited from I94 east and turned toward the southeast heading to River Falls, the view looked a little threatening. Then the radio reported there was only one noteworthy storm worth mentioning. With possible heavy rain amounts, high wind, and hail, in Goodhue and Pierce counties, it included the communities of Red Wing and Hager City. We live in Pierce county, a short distance north of Red Wing. Good, I thought. We could use the rain. I just wasn’t fired up about driving in the pouring rain. When I finally reached Beldenville, the road was soaking wet, but the rain was already done. It must have stopped just before I arrived. We live a couple of miles north of Beldenville proper, and when I turned onto County J, the pavement was bone dry. We didn’t get a drop at home. I stepped out on the deck to take a picture of the drooping sunflower for a representation of how the plants are feeling about our long spell without rain. As I stood there, I noticed there was a lot more than just the sunflower that would show up in the frame. 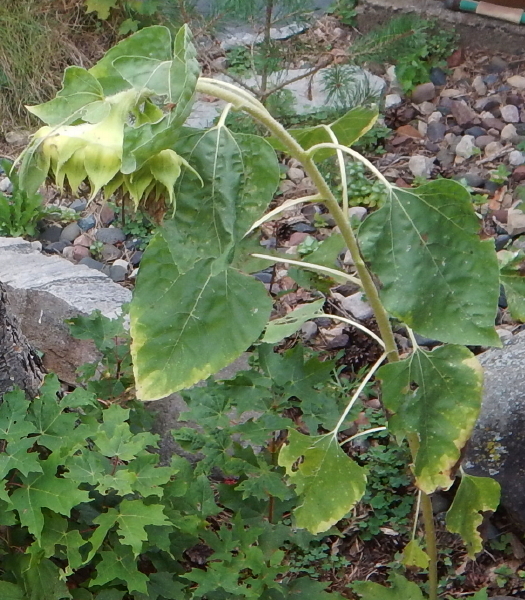 This sunflower made a surprise appearance, most likely growing from birdseed that fell from the feeder nearby. It shot up with robust energy at first. When the ground started to dry out, the growth stunted significantly. It hasn’t looked very happy ever since. There used to be a big pine tree here. I’m guessing it might have been root bound, based on my recent discovery about the pines out in the field north of the driveway. 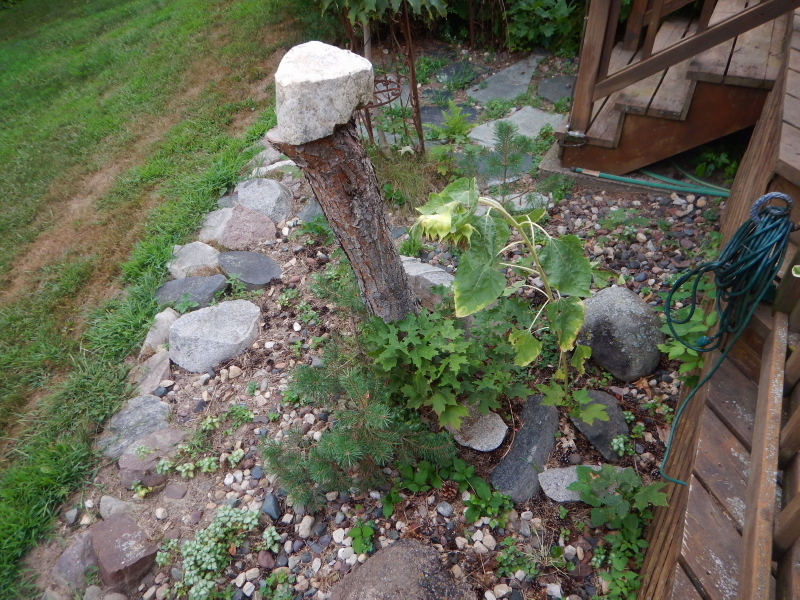 We left it standing until it was good and dead, then I cut it down, leaving enough of the old trunk to have a nice support for a balanced rock. 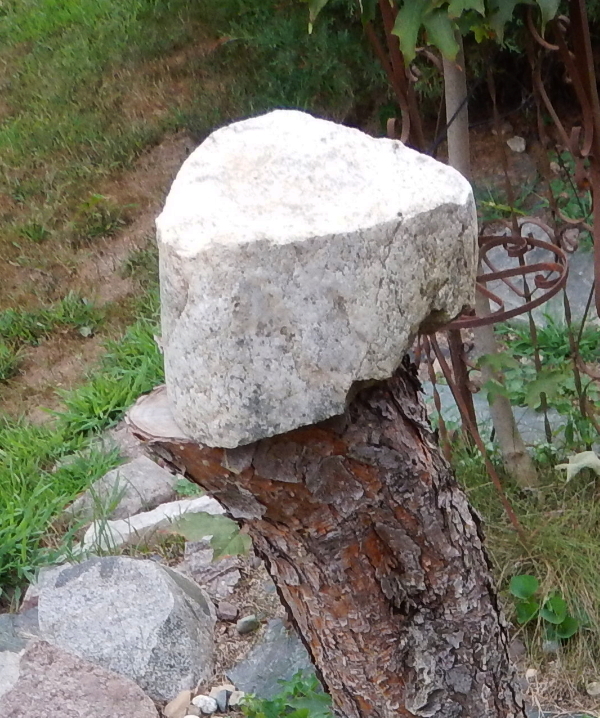 Using this chiseled stone for a base (probably a remnant from the construction of the field stone chimney on the house), I balanced a large rock that I was only barely able to lift up to the necessary height. I’ve yet to decide whether to put a different one up there, but I’ve definitely chosen to leave the too heavy one safely on the ground where it landed. 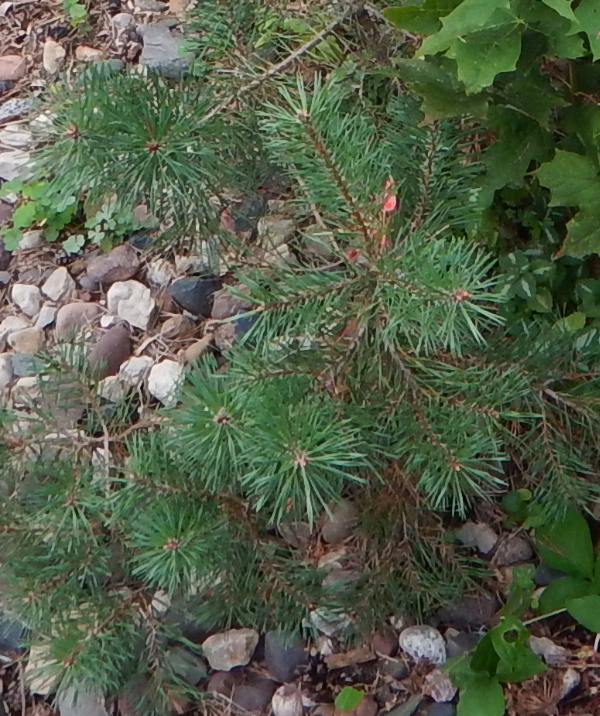 Even though the big tree died, the ground seems to be fertile for a new generation of pines sprouting in its place. There are at least three rising up around that stump, taking advantage of the sunlight available since I cut the big one down. And where do baby trees come from? 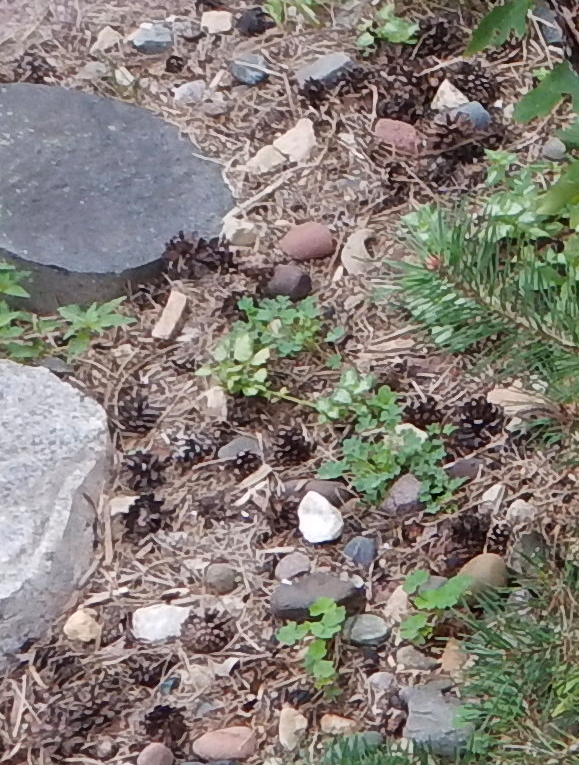 The number of pine cones remaining from the now-removed tree seem to offer plenty of clues. Maybe if we come out of this dry spell, more of those seeds will sprout.